Today’s bows are more tunable and accurate, thanks to specialized engineering that places the arrow at the center of the bowstring and riser. This minimizes vertical torque and helps make lower-brace-height bows shoot smoother and conceivably more accurately than longer-brace-height bows from the past. I've spent a considerable amount of time testing bows — not so much in a lab or controlled shooting environment but out in the woods or mountains while hunting and stump-shooting. As the years have gone by, I’ve seen an array of engineering techniques used to make bows faster, smoother and more accurate. My conclusion is this: A bow is a system and one single detail won’t make the bow better compared to the next one. Instead, the bow’s features, including the shape of the riser, its balance and geometry, and its overall feel in terms of how it draws and anchors, is what determines how well a bow performs. Brace height has the ability to negatively or positively influence shooting forgiveness. It’s measured from the throat of the bow’s grip to the center of the bowstring. The brace height influences an archer’s power stroke (distance from the bow grip to the archer’s full draw position). The powerstroke then affects the amount of time the arrow stays in contact with the string before launching past the riser. The greater this “contact time,” the faster the bow, all else being equal. However, at the same time, this theoretically makes the arrow more susceptible to “archer” torque since it’s clipped to the bowstring longer. This could make the shot, and bow, less forgiving and less accurate. In addition, a lower brace height places the path of the bowstring closer to the forearm, increasing the likelihood of “string slap.” All these factors are what the brace height fight is all about, and why the debate over the most suitable brace height continues. In the past several years, the top bowhunting bows have incorporated brace heights ranging anywhere from 6 to 7 inches, or thereabouts. But, each year or two a company’s flagship model seems to sport a slightly different brace height than the year prior. Why is this? Why the tug-of-war between ½- or 1-inch of brace height? I believe there are some viable reasons for this. To begin with, speed sells, so manufacturers must meet the need of the consumer. Depending on what the demand is from one year to the next (335 vs. 340 FPS ATA), engineers answer accordingly with faster, lower brace-height bows to keep the sales numbers going and to satisfy archers who have a craving for speed. Secondly, bow engineers are getting better at what they do. They somehow improve upon bow design year after year, by pushing the envelope in terms of speed, low vibration, and shooting consistency. This is done by incorporating better materials and more efficient designs. Brace height details are no exception. With all of this in mind, let’s look at two specific areas where brace height poses a problem, and what engineers often do to lessen the effects. In other words, a low brace height has the potential to be more critical, even without the effects of shooter error, simply because of this built-in “vertical torque.” But, it can be reduced, obviously, by lowering the position of the arrow rest, so it’s closer to the bow’s grip. Bow companies have done an excellent job of doing this in recent years. One of my newest bows, for example, shows the threaded arrow rest hole 17⁄8 inches from the throat of the bow’s grip, whereas on an older bow, this same measurement spans 21⁄4 inches. Such design traits can make a big difference in how well a low-brace-height bow shoots. Of course, if you have a shorter draw length to begin with, you can use a lower-brace-height bow with less of a torque effect compared to an archer with a longer draw length using the same bow. In this regard, brace height and forgiveness are relative to your powerstroke, making short-brace-height bows (6 inches or less) ideal for short-draw shooters who greatly appreciate the added speed and arrow energy. Another common issue to low-brace-height bows is “top heaviness,” which impacts balance and shooting consistency. 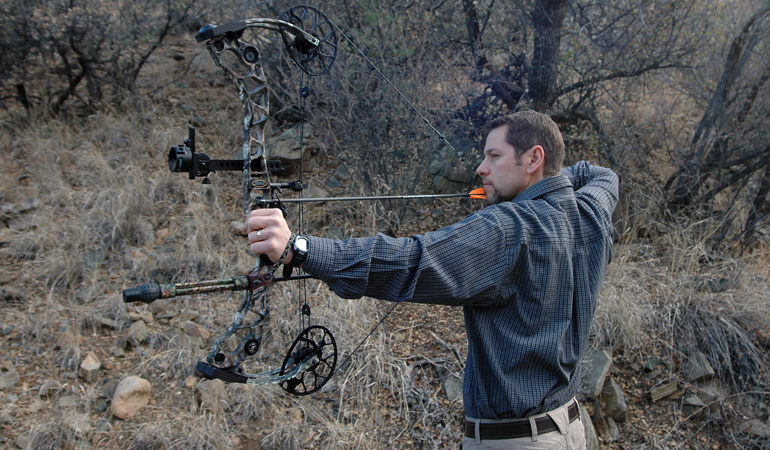 This occurs because short-brace-height bows typically have more “reflexed” risers, forcing the bow’s grip well behind the front of the riser tips and limbs, in addition to the bowsight. This extra weight causes a lopsided, forward-leaning feel.To counter this, engineers are sculpting risers, and even limbs, to improve this element. I know Hoyt’s new RX-1 features an asymmetrical limb pocket system that centralizes the bow’s mass to improve stability. Such important design tweaks give low-brace-height bows improved shooting feel and shot-to-shot consistency. Improved balance also comes through additional dampener, stabilizer or counter weight mounts, so the archer can personalize the bow’s balance. For example, Bowtech has done a great job with placing special weight-dampening systems at the ends of the bow’s riser, as seen on the Reign 6. Another option is to use an offset, back-rod stabilizer, like the AAE Hod Rodz Western Hunter, to improve bow control and steadiness. 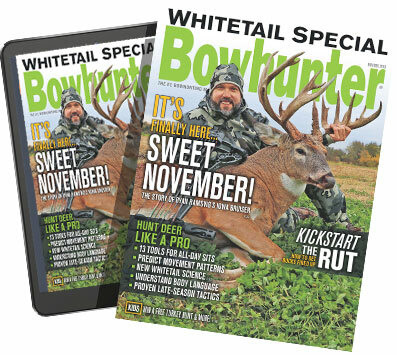 The upshot: there are some practical concerns when using a low-brace-height bow, but most of it revolves around specific draw length and the archer’s preference in bow feel and balance. Some may argue that a 7-inch brace height points better in the field than a 6-inch model, but this is certainly subjective and can be altered by using a different riser shape or by outfitting the bow with additional counter weights or a stabilizer system. Perhaps the most legitimate concern with using a low-brace-height bow comes back to string slap. Since a lower-brace puts the string closer to the arm, it can be an issue for some archers when hunting with a baggy sleeved shirt or jacket, particularly in cold weather. String stops certainly lessen this effect, but they don’t eliminate it completely. All in all, when sampling a new bow that has a lower brace height than your old one, be sure to shoot each model side by side. Pay close attention to feel, balance, and shooting consistency. Also, when test-shooting, wear your favorite hunting garb, including jacket, binocular harness, and other chest items just as you would when hunting. I would suggest forcing a couple bad shots, too, just to check on a bow’s tolerance for error, and try to duplicate an adrenaline-charged shot, just like it would happen in the woods. By testing bows and brace heights this way, you’re bound to find the right setup for you, regardless of what anyone else says.